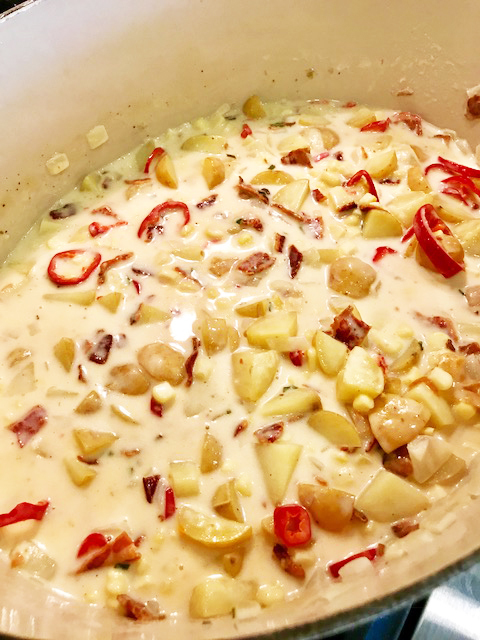 It’s that time of year to start experimenting with new soup recipes, and I thought I would try to merry corn and potato chowder because I couldn’t decide which one I wanted to make. 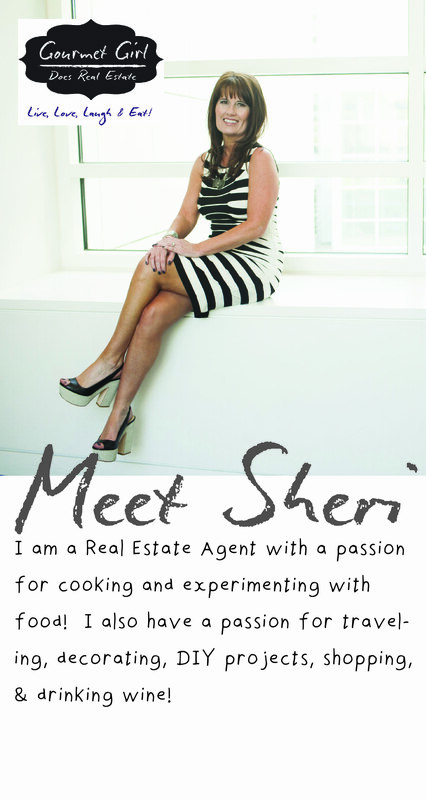 And of course if you follow my food blog, you will see I like to spice things up a bit on occasion! If you are not into spicy food, I would recommend only using 1 red fresno pepper, or none at all. 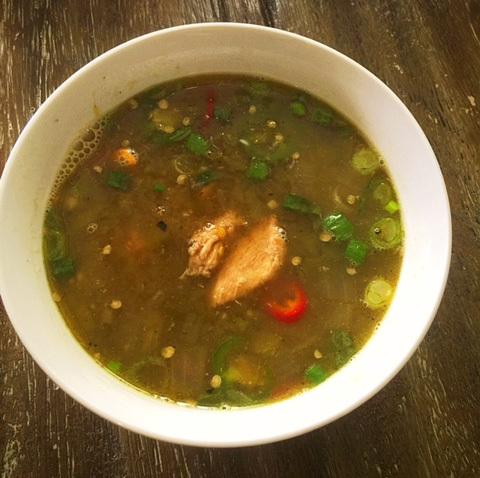 This soup will still have tons of flavor without the peppers. 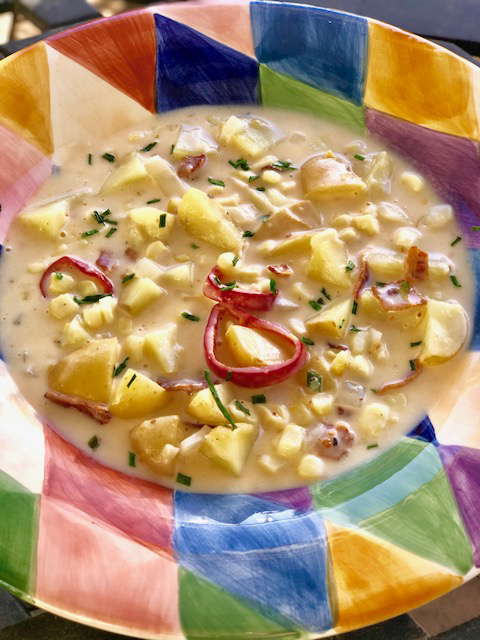 Spicy corn and potato chowder with bacon and chives. 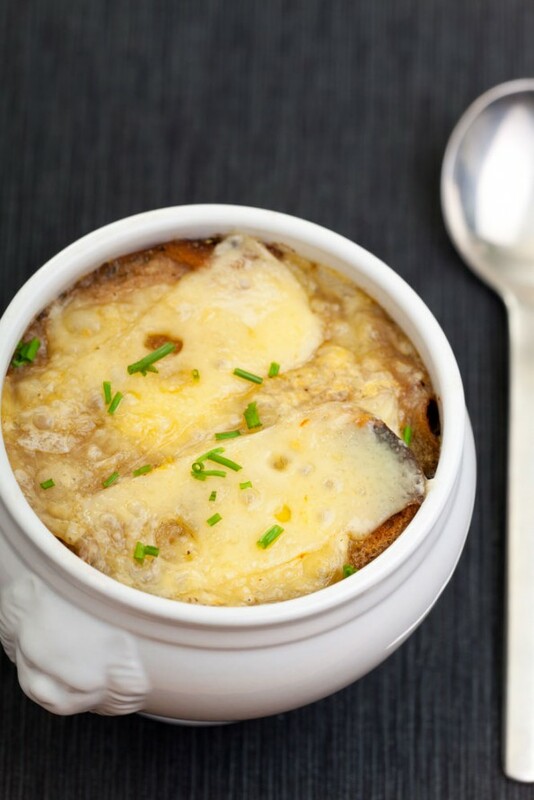 If you want to speed up the process for the soup, cook the diced potatoes in the microwave for about 5 to 8 minutes, or put in the oven for about 20-30 minutes at 400 degrees. Cook the bacon in the over or in skillet and place on paper towels to get all the grease out and set aside. In a large pot, cook the chopped onions with a bit of olive oil on medium heat and cook until onions are translucent. Add the chicken or vegetable broth and chopped potatoes; bring to a boil and let simmer for about 10 minutes. If you did not pre-cook the potatoes, you will want the potatoes to simmer another 10 minutes or so. In a cup whisk the milk and flour together and pour into the potato mixture. Add the corn, red fresno peppers, pepper jack cheese, heavy cream, bacon, salt and pepper and stir. Then let simmer for another 10 to 20 minutes before serving. You can add some of the chives into the soup while simmering and use the rest as garnish. 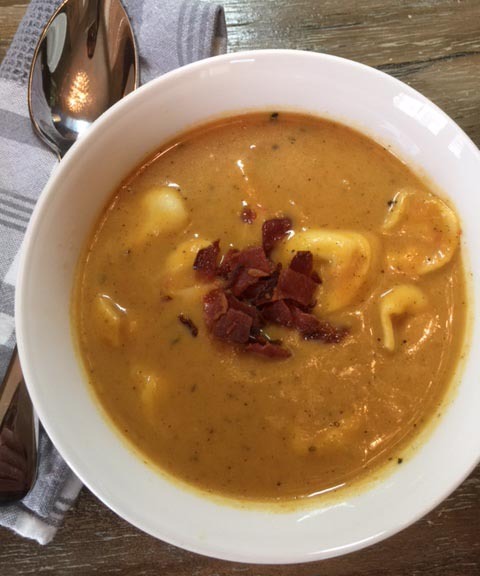 I love winter and trying out new soup recipes! Since the holidays are approaching, I am trying out new recipes with pumpkin, sweet potatoes, butternut squash and yams. 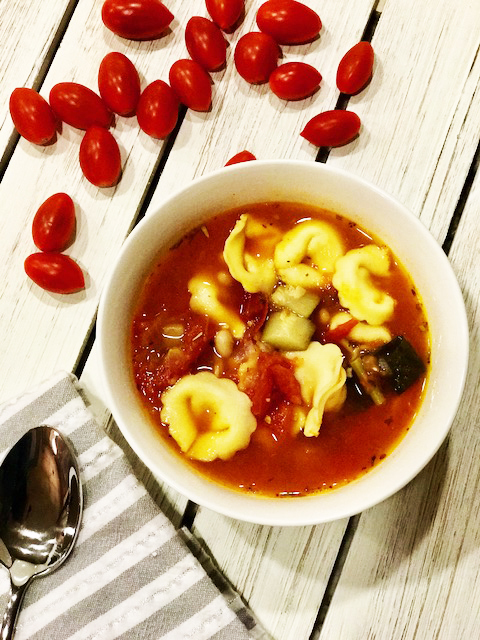 I came up with this interesting pumpkin tomato tortellini soup that tasted pretty darn good, so I decided to post this one. I hope you enjoy as much as my husband and I did. Cook the bacon and crumble into small pieces and set aside for later. Drizzle a bit of olive oil or grape seed oil into a large pot and add onions and garlic. Cook at medium heat until onions are translucent. Add the chicken broth, cream and pumpkin puree and mix well. Then add the other spices and cook at low heat for 15 -20 minutes. 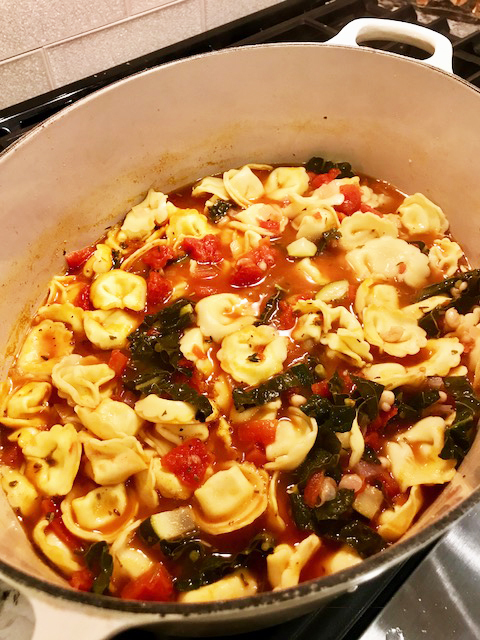 Add the tortellini and cook at low for another 15 minutes and serve. Easter weekend I went with my family to Angels Camp and we stayed at the Wyndam condos. I was responsible for making dinner one night. I brought my crockpot and was able to do my prep work in the morning and let it cook all day while we were out having fun at Big Trees. 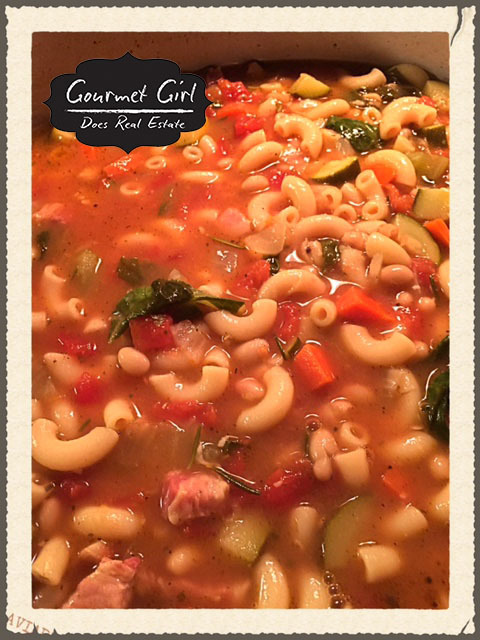 My soup was a big hit! I also made mini sliders with Hawaiian rolls along with a strawberry and blueberry mixed green salad. I have posted the salad recipe separately. This recipe makes up to 10-12 ramekins! Place butter in large skillet with the onion strips and cook on medium heat. Add fresh thyme and the stout beer. Cook until translucent. The onions should have a bit of sauce to it from the beer and butter. You will need it because once you add the flour it will thicken. Slowly add the flour while stirring. Take off heat and set aside. In a crockpot add the beef broth, Cognac, more fresh thyme, Worcestershire sauce, bay leaves and salt/pepper. Then add the onions and stir everything together before putting the lid on. Cook 8 to 10 hours. Pour soup into large ramekins and place on a cooking sheet. 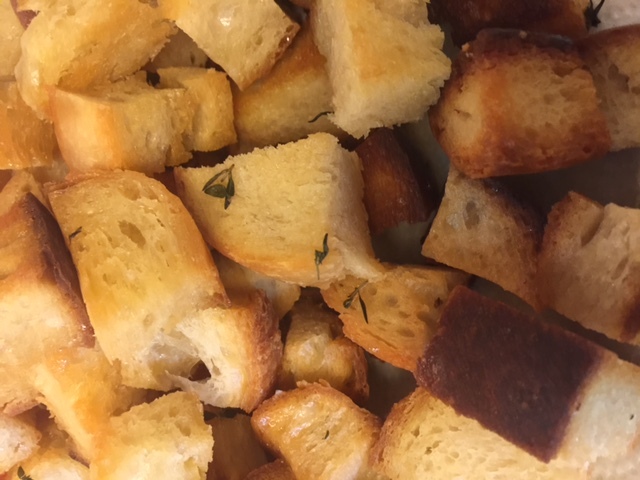 Add homemade croutons as well as 2 to 3 slices of gruyere cheese to each ramekin (see crouton recipe below). Place in oven and broil on high for approximately 5 to 10 minutes. Get 1 to 2 large loafs of sourdough bread and cut into large pieces. Place cut pieces into a large bowl. Melt 1 to 2 sticks of butter and mix with the cut pieces of bread with a wooden spoon. Drizzle your favorite olive oil over to help coat the bread as well. I like to use both butter and olive oil because it gives a better flavor. Add fresh or dried thyme and mix. Parmesan cheese would be good as well. Place on a cooking sheet at 400 and monitor until it looks crispy. It takes approximately 15 minutes. During the fall and winter season, I make a lot of soup. There is nothing better than good comfort food when it’s cold outside. 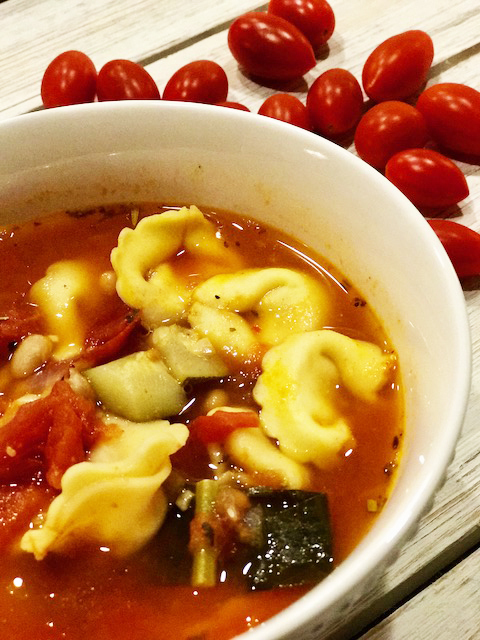 Ministroni soup is right up there with some of my other favorites and is easy to make. This is the kind of soup where you can experiment with different vegetables. Heat olive oil in a heavy large pot over medium heat. Add the onion, carrots, celery, pancetta, and garlic. Saute until the onion is translucent, about 10 minutes. Add the Swiss chard and saute for 2 minutes. Add the diced tomatoes. Simmer until the chard is wilted and the tomatoes break down, about 10 minutes. I usually add the macaroni noodles after I put everything else in the soup and let it simmer for an our or so. You can also cook the noodles separately and put them in the soup afterwards. 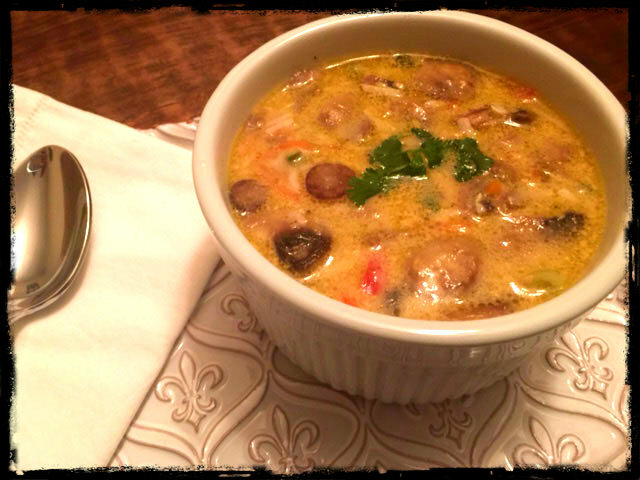 Ladle the soup into bowls and serve. Top with Parmesan cheese.